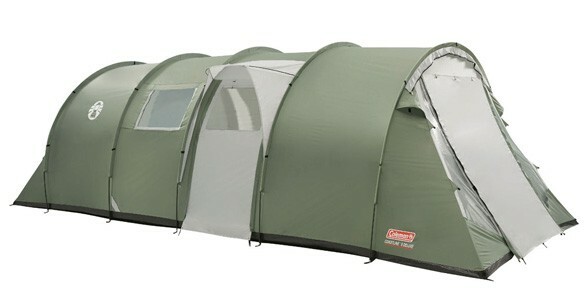 Effortless to pitch thanks to it its stable and strong tunnel structure, the design focuses on the group’s convenience with handy features such as the peak protection to shelter tent doors, the new Coleman® self-rolling window covers, a cool air port for optional air conditioning, a quick access power cord vent and a sewn-in groundsheet to keep the elements out. Tunnel tent structure offering a good internal space and easy pitching. Each individual bedroom sleeps 2 people, providing both privacy and flexibility; you can remove bedrooms according to your sleeping, living and storage needs. Perfect if the weather turns poor and you need to create more living space in an instant. The Coastline Deluxe has a fully integrated sewn in PE groundsheet, providing dry and bug-free camping. The living area groundsheet is a thick PE to resist heavy use. The bedrooms also feature strong and resistant PE. The Coastline Deluxe features rain protection peaks; pole-tensioned fabric providing a porch area over the doors to prevent rain from entering the tent on entry and exit. A set of porch poles is supplied allowing one door to be created into a porch area. Includes the Cool air port for increased ventilation. The new Coleman exclusive self-rolling windows means you don’t need to roll the windows manually, a spring coils up to do the job. Features 2 doors, one side door and a large door that can be opened into a large porched area. Optimally place guy-lines along the poles and around the tent ensure stability in high winds. Up in one pitching allows for quick and easy pitching; the inner bedrooms are pre-attached and they can be left in when packing the tentaway.